This page describes how to download books from ACE in accessible formats. To download a copy of a book from ACE, click on the title of a book from the search results page to open the individual page for the book. Please note, books can only be downloaded one at a time. If you are correctly logged in, download links will be presented below the cover image on the book page. If there are no download links and you are getting prompted for an access code, please see the tutorial on logging in. There are three kinds of books you might encounter: ACE books, regular ebooks, and XML ebooks. Every ACE book is available for download in five accessible formats: colour PDF, black & white PDF, DAISY, plain text file (TXT), and ePub. More details about each of these formats can be found in the FAQs. Regular ebooks are typically available to download as PDFs only. These are ebooks that your library has purchased, and as an authorized ACE user you are eligible to download as an accessible PDF. XML ebooks display as an HTML page in your browser. You may be able to download an excerpt as a PDF using the Print button at the bottom of the page and printing to PDF. If you need an ACE book converted into a KESI (Kurzweil) file or an MP3, or need help opening or using a book you have download from ACE, please ask your local ACE coordinator for assistance. Whenever possible, ACE will automatically split a book up into individual chapters so you can download them separately. Individual chapters are listed below the five download links for the whole book, underneath the Download Chapters heading. Below each chapter title, there will be a link labelled PDF. Click on this link if you would like to download the corresponding chapter. Please note, individual chapter downloads are only provided as colour PDFs. They are not available in the other four formats. 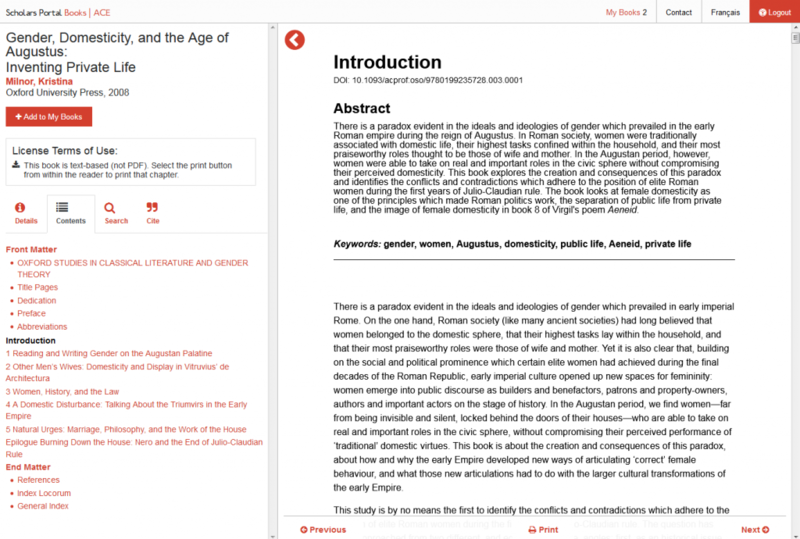 Books are split into chapters and titled automatically by the ACE system. Chapter downloads can only be created for books that contain a Table of Contents, so if the book itself does not contain a Table of Contents, chapter downloads will not be generated. Examples of books that might not include a Table of Contents are older or non-traditional books. Also, some ebooks do not allow chapter downloads. Unfortunately, the system isn’t perfect, so sometimes chapter downloads don’t show up correctly even for books that do have a Table of Contents. If you’re having trouble with chapter downloads, for example, the individual chapter files are missing or incomplete, or the chapter titles are filled with strange symbols and characters instead of being useful, please let us know through the Contact form linked on the upper right ACE. This way we can make sure we are aware of the problem right away, so you can get the files you need as soon as possible.